Pretty soon there will be a special place to drink on Celebrity’s Solstice-class ships. It won’t just be a bar, but a “World Class Bar.” Its specially-educated bartenders will be dispensing “luxurious drink experiences” consisting of high-end cocktails, craft cocktails and “rituals” available only aboard Celebrity. The partnership between Celebrity and Diego Global Travel Americas began recently with the opening of the first World Class Bar aboard Celebrity Eclipse, but it will soon expand to the other four ships. A cruise ship is constructed of giant preconstructed blocks, and the blocks are fitted together in the dry dock. Once the final one is in place. the ship can be floated and towed out of the dry dock to a finishing dock, making space for another ship to be built or repaired. 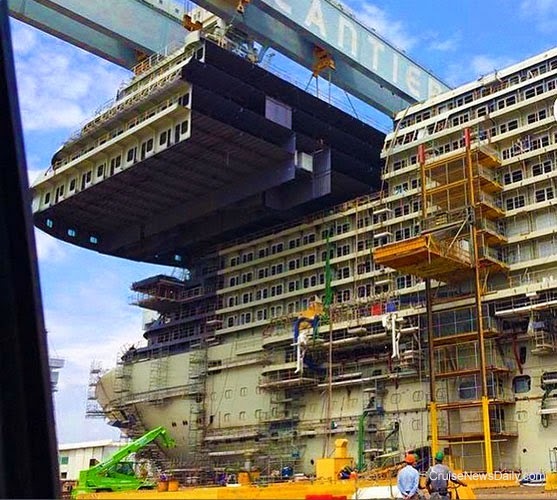 The final block of the 133,500-ton Carnival Vista was put into place this week at the Fincantieri yard in Monfalcone (Italy). The ship is scheduled for delivery next spring. This photo, showing Allure of the Seas at the end of its dry dock last week in Cadiz (Spain), was tweeted by Royal Caribbean. It's a still from a video by UAV Aerials, which is a company that specializes in video productions shot with drones for very unique perspectives. 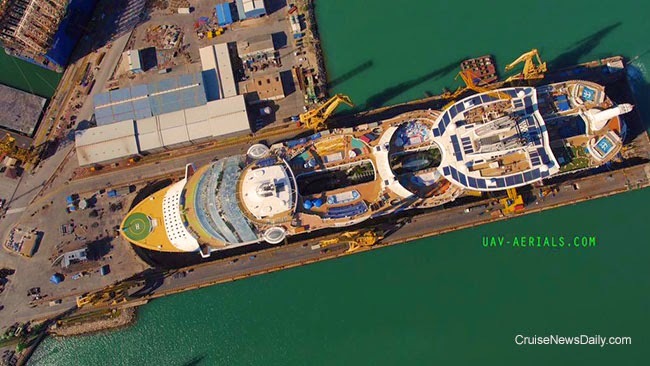 Photo courtesy of Royal Caribbean International and UAV Aerials. All rights reserved. May not be copied or used without permission. Royal Caribbean's Allure of the Seas returned from its routine dry dock this week to begin its Mediterranean program. 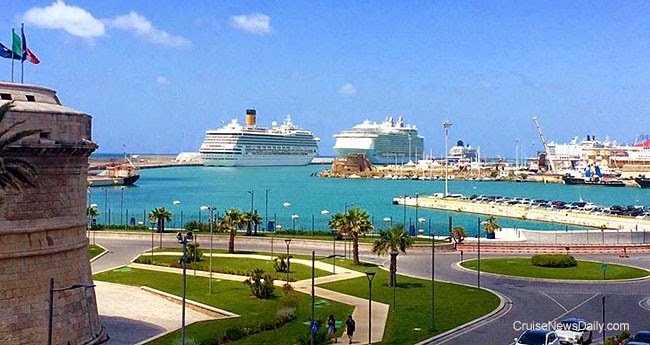 It is shown below at Civitavacchia (the port for Rome) during its first call today (center ship). It is seen alongside Costa Fortuna (left) and CDF's Zenith (right). Allure of the Seas (center) at Civitavecchia today. Seattle, Wash., May 21, 2015 — Holland America Line has made two promotions in the Revenue Management Department: Carole Biencourt was named pricing and demand director, Europe cruises; and Justin Poulsen was promoted to pricing and demand director, Voyage cruises. In their new roles, Biencourt and Poulsen are responsible for planning, positioning and strategizing how to price and sell Holland America Line’s worldwide cruises. Both directors report to Beth Bodensteiner, senior vice president, revenue management. Biencourt, who began her career with Holland America Line more than 30 years ago, most recently was senior manager, revenue accounting, where she supervised a team of 10 employees. During her time with the company, she has risen through several analytical roles serving the marketing and finance departments. Poulsen joined Holland America Line in 2010 and most recently was senior manager, deployment and itinerary planning, where he conceived, designed and implemented global deployments for the company’s fleet of 15 ships. (WASHINGTON, DC) May, 20, 2015– Cruise Lines International Association (CLIA) today announced Thomas P. Ostebo will join CLIA as President and Chief Executive Officer, effective July 6, 2015. Selected by CLIA’s Global Executive Committee, Ostebo will oversee CLIA operations both domestically and internationally, working directly with his senior leadership team to execute the organization’s vision and work on behalf of CLIA members. Celebrity Cruises said today that beginning next January, they will expand the number itineraries in the Caribbean with overnight calls. The overnight calls have been a popular Celebrity feature on European itineraries for some time. After another day of checks and certifications, Norwegian Dawn was pronounced fit to sail, and it left for Boston this afternoon. It is expected to arrive Friday as scheduled, and the next cruise will depart on time. The line said the damage to the ship amounted to some superficial scrapes on the hull. They determined the cause of the steering malfunction yesterday was a spare oil pump which had been installed with the pressure set incorrectly. A small fire aboard Norwegian Escape on Tuesday evening in the shipyard. Update 11:15pm EDT - Norwegian Dawn ran aground while leaving Bermuda this afternoon.The ship lost power briefly which caused it to lose propulsion temporarily and it made contact with the sea bed. The ship's officers and an independent dive team have confirmed the structural integrity of the ship. Norwegian Dawn was refloated and moved to an anchorage where it will be reinspected again on Wednesday before sailing to Boston. The ship has full power and all onboard services are continuing normally. Norwegian Dawn was on a seven-night cruise from Boston. Details are in the May 19 edition of Cruise News Daily. For the last three years, the Denali Princess Wilderness Lodge has received part of the catch and served fresh king salmon to lodge guests on arrival, just hours after the fish were swimming in the river. This is the story of how it happens. Disney has a way of keeping everybody happy. Not only do their ships sail to various popular cruise destinations, rotating every year, but they also change up home ports every season so every couple of years they are sailing from a home port near your home. Today Disney released the late 2016 (fall) deployments for Disney Magic and Disney Wonder. If you want to sail from New York, Miami or Galveston this fall, you’re in luck because Captain Mickey will be dropping anchor in your port. A 10-year-old girl drowned in the swimming pool aboard Norwegian Gem on Sunday as it was traveling from New York to Port Canaveral. A 31-year-old man from Maryland arrived in Juneau Saturday morning aboard Coral Princess and was planning on going on a whale watching excursion. He was traveling with his parents and his younger sister. When he came down the gangway, however, he didn’t get very far. Juneau police were waiting for him and took him into custody on charges connected to a burglary and double murder back in Maryland.